Remote Emergency Care facilitates practical, concept-based training in first aid and pre-hospital care for rural, remote and wilderness groups. We support a global network of professional trainers who deliver Remote Emergency Care courses to diverse client groups. These include individual outdoor enthusiasts, outdoor instructors, mountain rescue teams, expedition teams, doctors and large multinational corporations operating in wilderness environments. Our strength is in our trainers. A Remote Emergency Care trainer has a strong background not only in medicine, but also in the outdoors. Our trainers include experts in the fields of climbing, kayaking, mountaineering, yachting, sailing, diving, exploration and rescue. The Remote Emergency Care trainer's skill and experience empowers him or her to adapt courses to meet the exact needs of the client group. We believe pre-hospital care is a practical skill - all our courses are heavily practical and scenario-based. 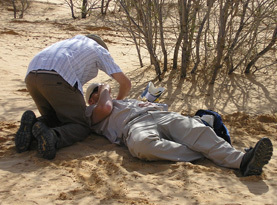 Remote Emergency Care courses range from introductory level through to Wilderness Emergency Medical Technician and Wilderness Physician training.